A black and white negative of Ralph McCarl posing in his hockey uniform and equipment outside of a house. There is a white backdrop in the background. 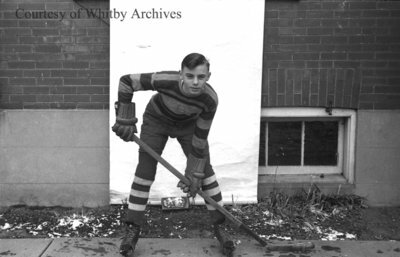 Ralph McCarl played for the Whitby Bruins Midget hockey team during the 1938/1939 season. Ralph McCarl, November 26, 1938, Marjorie Ruddy. Whitby Archives A2013_040_719C.